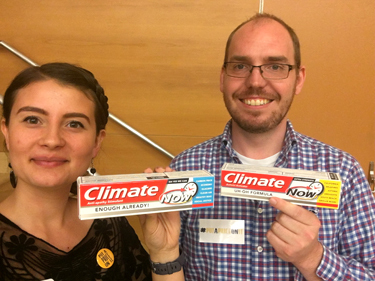 Climate Toothpaste helps climate groups with outreach and volunteer recruitment. Get Fresh n' Clean. 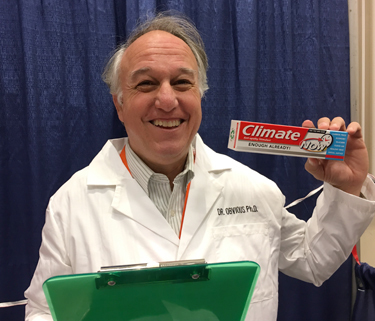 Climate Toothpaste gets noticed! I crowd-funded and created Climate Toothpaste in 2016, to help carbon pricing groups recruit volunteers and raise awareness. Our climate crisis is colossal. We need more active volunteers in the movement, and we need to educate people. 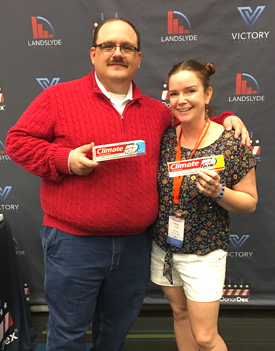 Climate Toothpaste connects people who care but are not active on climate, to groups that need help. It's an unexpected art object that sparks conversations about climate change. It's not toothpaste! Sorry. The letter inside the box lists climate groups in YOUR home state. 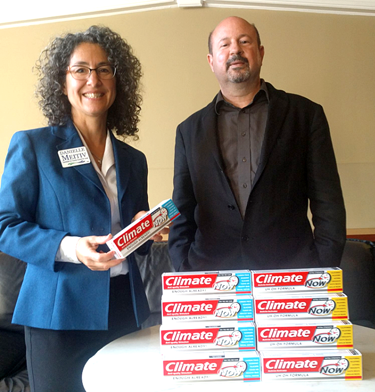 I gift Climate Toothpaste to climate groups, including Our Climate, CarbonWA (behind I-732, Washington state's revenue-neutral carbon tax), and some chapters of Citizens Climate Lobby. I also gift and sell it to political candidates who are running on climate, and I sell it on my website climatetoothpaste.com. 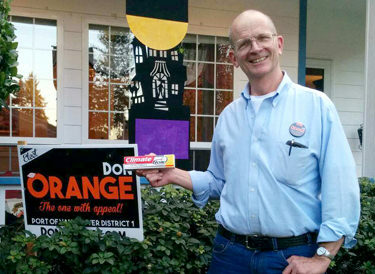 • Supporting political candidates who are running on climate, with Climate Toothpaste (see below: these photos have been updated to reflect recent progress). So far Climate Toothpaste is me, doing everything. I would like to hire someone to do online marketing research and implementation for me. I can do outreach. But online marketing and advertising are beyond my bandwidth and budget. Here’s a very short list of some people and groups I want to reach out to: the Campaign for a Clean Energy Future, in MA; Senator Sheldon Whitehouse; Elon Musk; Bill Nye the Science Guy, Michael Mann, Neil DeGrasse Tyson; Mark Tercek of the Nature Conservancy; Rose Marcario of Patagonia; Tom Steyer of NextGen; Senator Jeff Merkley; the Bill and Melinda Gates Foundation; the Leonardo DiCaprio Foundation; future Democratic Presidential candidates; any coalitions that are working on a carbon price in any state. Also science museum gift shops could be great venues for Climate Toothpaste. My scope is national, so far. On my Climate Toothpaste website I have 50 state-based letters in pdf format available for free download. 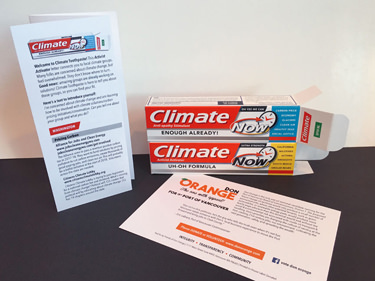 And Climate Toothpaste is being used on college campuses around the US with Our Climate's #putapriceonit campaign. It seems safe to say that new locations will depend on where I find future partners. This project can also be replicated in other countries. I don't think I have the right type of calculator to answer this question. Climate Toothpaste can help reduce greenhouse gas emissions and help with climate adaptation, but only by educating and motivating folks to act on climate. However I do have good news: Climate Toothpaste is already doing that job really well. 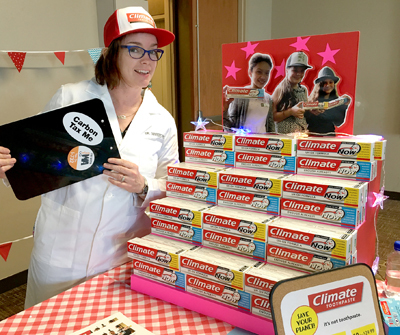 Page Atcheson, Executive Director of Our Climate, says she has seen a 50% increase in volunteer recruitment when Climate Toothpaste is used for tabling. My main objectives are sparking conversations about climate change, and educating the public. 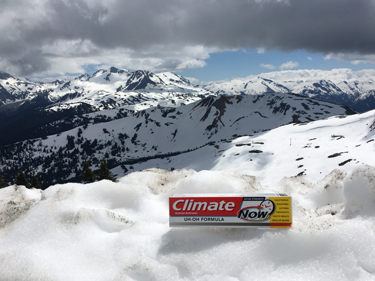 Climate Toothpaste does that two ways. On the front side of my Activist Activist letters is a list of climate groups working in your home state. 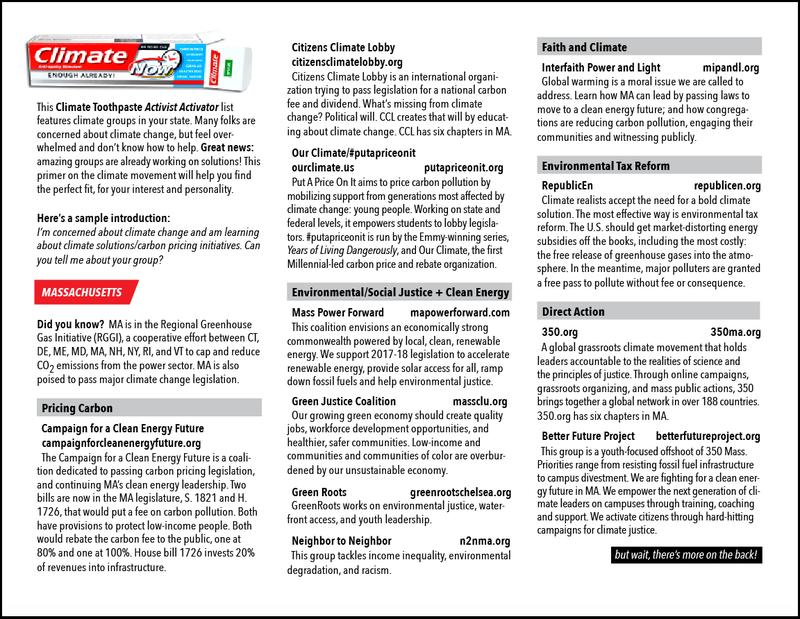 In the newly revised Massachusetts letter below, these groups cover a gamut from passing legislation, to environmental justice, to faith-based climate action, to civil disobedience. 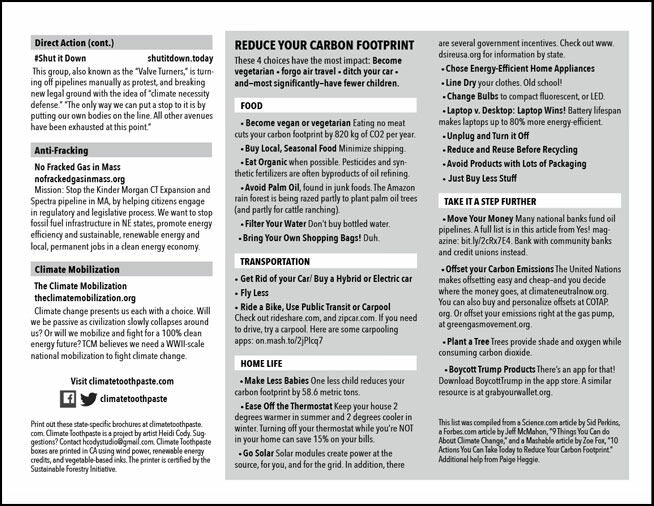 On the back is a list of tips to reduce your carbon footprint. You can download all Activist Activator letters for free from the Climate Toothpaste website. Nationally, students are also being recruited using Climate Toothpaste, into the #putapriceonit carbon pricing campaign. These students are lobbying their university Presidents and State Representatives, to endorse a price on carbon. While my impact may not yet be quantifiable, it certainly trends in the right direction. Climate Toothpaste is under two years old and is already having an impact. My goal is to keep the project going by making it solvent, and to expand its reach. I need to hire help to make the project work. 1-15 years: Help every possible climate group or politician that wants to use Climate Toothpaste for outreach and volunteer recruitment. 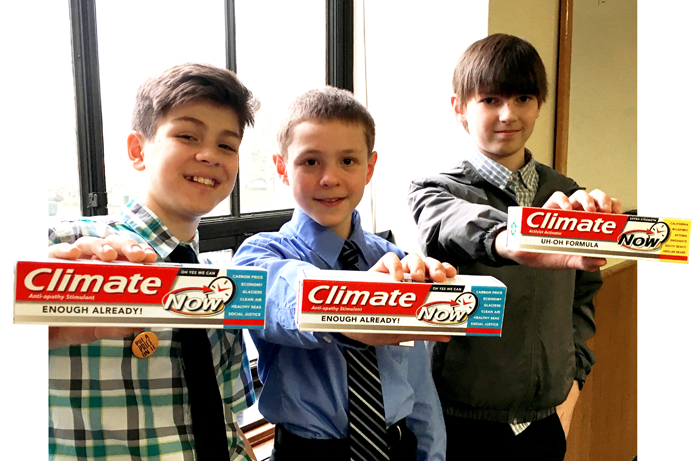 Develop a Climate Toothpaste lesson plan and presentation that I can use to support my project. Give talks and educate students from middle school through college. Continue to network and outreach by attending national conferences and smaller local events. Inspire other artists to tackle this problem in novel ways. Create a Spanish version of Climate Toothpaste. Possible expansion into other countries. 15-50 years: Inspire other artists to tackle this problem in novel ways. 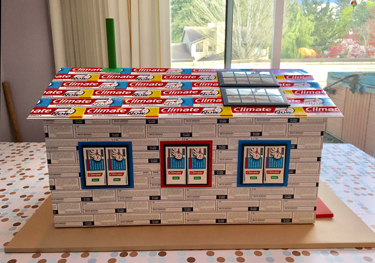 50-100 years: I'll be dead, but my five-year old daughter loves Climate Toothpaste. She wants to help. My name is Heidi Cody and I live just outside Portland, in Vancouver WA. 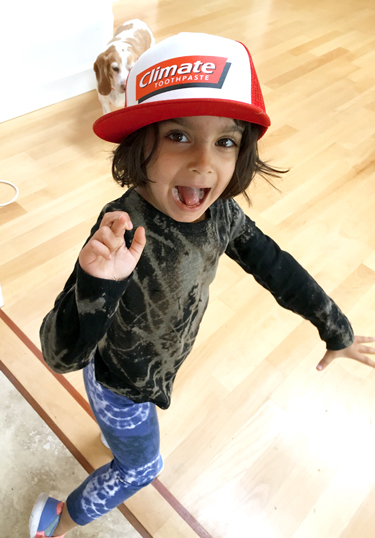 I am mom to a 5-year old, and am a climate activist and visual artist. I have a B.A. from Wesleyan University ('91) and and M.F.A. from the School of the Art Institute of Chicago ('96). I've been an artist for almost 20 years. You can see my newly revamped art website at heidicody.com. My art makes fun of American consumer culture. I was raised in Paris, France until I was 8. My dad would not get a color t.v. when we moved back to the U.S. He told me it would distort my sense of reality. I blame him for all my creative work. I became a climate activist when I went to the Earth Day march in 2014 in Portland and thought, Where are all the people? This is Portland! This is the word's biggest problem! I first joined Citizens Climate Lobby, did a couple fundraisers for them, and then got involved with Oregon Climate and CarbonWA. I was a de-facto organizer for Clark County WA on I-732, the revenue-neutral carbon tax initiative. I wish I-732 had passed. It's really hard to be an artist and a climate activist and a Mom. So I fused my artwork with my activism and came up with Climate Toothpaste. It's still hard, but much better. I have lived in Connecticut (4 yrs), Paris (8 yrs), Chicago (4 yrs), New York (10 yrs), Savannah (2 yrs), and have been back home in the Pacific Northwest for 7 years. Our Climate's proposal for Carbon Pricing, Put a Price On It, relates to my proposal. 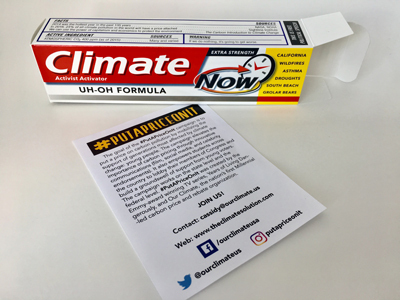 Our Climate is a partner organization that I gift Climate Toothpaste to, and #putapriceonit uses Climate Toothpaste effectively for recruitment. I have also been a core volunteer for Our Climate for three years. Please note: A variation of this application is also a semi-finalist in the "Pricing Carbon" category.